The diverse climates of Africa range from scorching deserts to icy glaciers, from steamy rainforests to grassy plains. Climate is a long-term weather pattern, the sum of features such as temperature, rainfall, and wind. The amount of heat from the sun plays a major role in determining climate. The equator receives more solar heat than any other part of the earth, and the zones on either side of the equator are called the tropics. Africa, with the equator cutting across its center, is the world’s most tropical continent. Only its northern edge and southern tip are outside the tropics. Half of Africa lies north of the equator and half to the south. This symmetry, or balance, produces matching belts of climate at approximately equal distances north and south of the equator. The center of the continent has a wet tropical climate, with extremely heavy rainfall. To the north and south are belts of tropical climate with a dry season. Beyond lie belts of tropical climate with longer dry periods and occasional droughts, such as those that have caused famines in the SAHEL. North of the Sahel lies the almost rainless SAHARA DESERT, but in the narrow southern part of Africa cool, moist air masses moving inland from the oceans bring some summer rainfall to the KALAHARI DESERT. Finally, north and south of the desert regions are belts of Mediterranean climate, with hot dry summers and mild moist winters. Other environmental factors, such as winds, ocean currents, and the surface features of the land, create variations within these climate belts, giving different regions of Africa their particular local climates. One of the chief climate shapers in sub-Saharan Africa is the Intertropical Convergence Zone, or ITCZ, which is the point where warm, moist tropical air masses meet. The regular cycle of movements of the ITCZ carry it north of the equator between March and June and south of the equator between September and December. 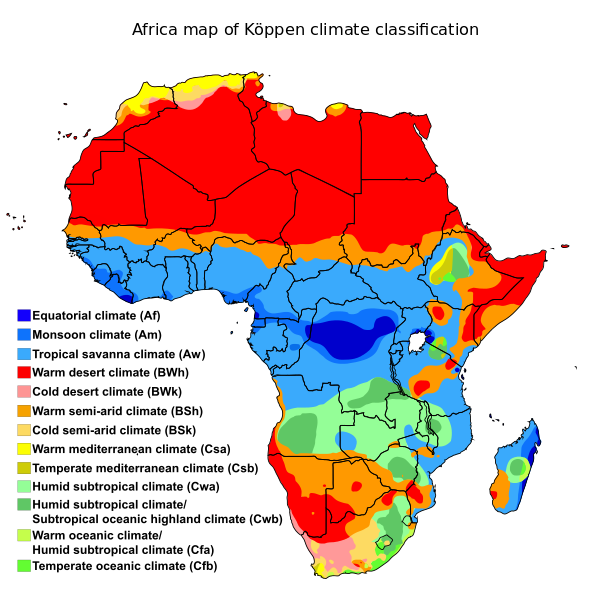 These movements determine the number and timing of rainy seasons throughout Africa. Areas within the path of the ITCZ have two rainy seasons; those at the northern and southern reaches of the ITCZ’s path have only one rainy season. The Sahara in the north and the Namib-Kalahari desert region in the south lie outside the influence of the ITCZ and receive little precipitation. Mountains and ocean currents influence climate as well. Mountains force the air masses of the ITCZ to rise, grow cooler, and shed their moisture in the form of rain or even snow, giving mountainous areas greater annual precipitation. The cold Benguela Current in the Atlantic Ocean cools the surrounding air and keeps the ITCZ away from southwestern Africa. As a result, that region generally receives little rain. It does, however, get some moisture from fog that forms along the coast. Seasonal movements of the atmosphere over the North Atlantic Ocean affect the climate of North Africa. In the summer, an area of high atmospheric pressure known as the Azores High blocks moist Atlantic air from reaching the region’s Mediterranean coast. For this reason, summers in North Africa are hot and dry, influenced by winds blowing north from the Sahara. In winter, however, the Azores High moves southward, allowing cool, damp air from the Atlantic to reach the coast, bringing milder and wetter weather. Each climate region has its local variations. The Mediterranean climate of North Africa brings its coast at least 16 inches of rainfall a year, with some mountainous areas getting several times more. However, the region’s southern interior has a desert climate with fewer than 4 inches of precipitation. Between these two areas is a region of dry, flat plains, called steppes, where annual rainfall ranges from 4 to 16 inches and summer droughts last five months or longer. Rainfall in the steppes can cause devastating flash floods. Equatorial Africa includes the southern coast of West Africa and the rainforests of Central Africa. This region receives heavy rain throughout the year, although there are two periods with even more rainfall. These rainier seasons generally last from September to November and from February to June, although they are longer near the coast. The interior of West Africa, the Sahel, Sudan, and the Ethiopian highlands form another, drier climate region. The northern parts of this area receive less precipitation than the southern parts and have a single rainy season from October through June. In addition, rainfall in the region generally decreases from west to east. Parts of eastern Ethiopia and Somalia near the Indian Ocean have a desert climate. East Africa, consisting of Uganda, Kenya, and Tanzania, straddles the equator. It has a hot, humid climate along the coast and around Lake Victoria, but cooler climates in the highlands and mountains. The rainiest areas are the Lake Victoria basin, the mountains, and the coastal islands, which receive more than 59 inches of rain annually. Other parts of the region average 30 inches of annual rainfall. April and May form one rainy season, October and November the other.